Charming, oceanfront getaway w/ gorgeous water views & easy beach access! 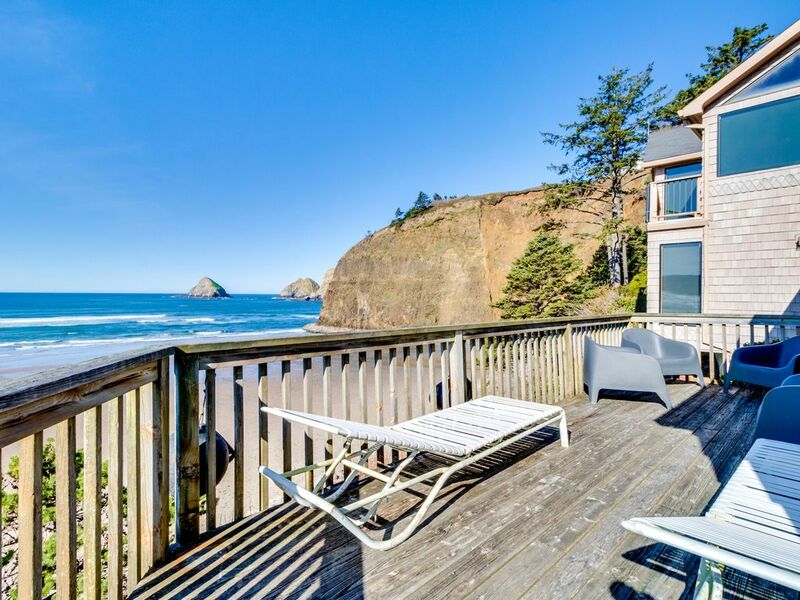 The Oceanfront Cottage is a lovely oceanfront rental for groups of friends or family to get away from it all on the Oregon Coast. Located in the quiet town of Oceanside - a residential town with a scattering of shops and a long strip of beach - this home sits one a small cliff overlooking the surf, with access to the beach two houses down. The open floor plan, blue furnishings, and ample windows lets in all the views of the Pacific you could desire, while providing entertainment amenities like WiFi, cable, and a DVD player. Let the fireplace heat up the space while a movie plays and the waves crash outside. The eat-in kitchen is naturally-lit and spacious with white everything. Enjoy playing with the blender and the electric mixer, and put dirty dishes in the dishwasher. Dine inside at the six-top dining table, or out on the wrap-around deck. This three-bedroom, two-bathroom home sleeps a total of eight guests. The lower-level master suite has a queen bed and a full bath with a soaking tub/shower combo. Upstairs is a bedroom with a queen bed, and a bathroom with two doubles. These two bedrooms share a full bathroom, and both have sinks inside the rooms for convenience. All of the bedrooms have lovely views. There is an additional sleeper sofa for convenience, as well as a washer/dryer. From the comfort of this home, guests can visit the beach for long strolls and sea shell collecting, or drive to Cape Meares to hike to the Cape Meares Lighthouse. Head to Tillamook to visit the cheese factory, or stay inside your cozy beach cottage with a book and relax! Whatever your dream vacation, make it happen in this Oceanside vacation rental! Parking Notes: Guest can fit one regular car or two smaller cars tight in the front of the house and there is a spot usually available across the street that can hold one or two cars. We loved the spaciousness, the well-outfitted kitchen where a group can cook together, the light flooding in, the great deck with terrific view, comfortable beds and wonderfully soft bedding. A great place to celebrate a 71st birthday with adult sons. We'll be back with more family members. Wonderful house with a great location right on the beach. This house is nicely furnished and has everything you need for a stay at the coast! The area is wonderful... The house has a wonderful kitchen, nice bedrooms & all of the amenities. On the beach with a fantastic fireplace. Our family so much enjoyed our vacation.